A guided walk around Friedrichshain, where the old East Berlin environment meets classical architecture and modern features creates a colourful neighbourhood that still manages to remain certain spots untouched by Westernisation. The guided tours are intended for everyone and will be customized based on the interests of the unique individuals. Both small and larger groups are welcome to sign up. Normally, we include lunch or dinner at one of the local restaurants. The total price for a guided tour and lunch/dinner does not generally exceed € 25 per person. As for private visitors, we offer a guided tour of the gallery, talks about/with the artists as well as general information about the architecture in the area and the identity and history of Friedrichshain. For those really interested in art, we provide a customized guided tour. The package includes a tour of the gallery, lectures about/with the artist, a tour about the architecture in Friedrichshain and its identity and history as well as visits to different artists. Please note that the meetings with the artists are only made possible by appointment. For school classes, we provide tours around Friedrichshain where we talk about the architecture, the identity and history of the districts as well as meetings with other young people from the area. Bring your employees on a guided tour of the gallery, discussions with or about the artists plus a tour of the area, its architecture, identity and history. These tours are suitable for groups of 10-40 people. The price for a guided tour is € 10 per person and is maximum three hours long. You can now experience guided tours with the topic of art and GDR stories in Galleri Heike Arndt Berlin – in collaboration with Jugend [widerstands] museum! 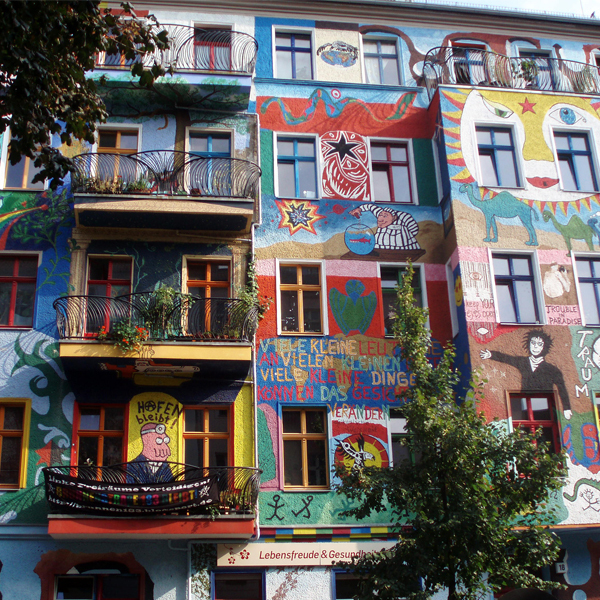 Friedrichshain has a long tradition as a place of civil resistance and disobedience to oppression and restrictions of freedom. With the opening of the permanent exhibition “Do not wait for better times”, the Hedwig-Wachenheim-Gesellschaft e.V. has made the Galiläakirche church a place where the youth resistance in the GDR is permanently documented. Especially young people are invited to grapple with the GDR history. Contact us to book a guided tour for 10-120 people!